Shapleigh Sharks News For January Now Available! -Fourth graders learning about sound transmission and creation from Mad Science of Maine! 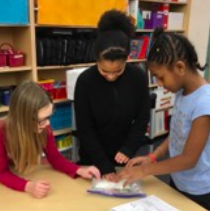 -Fifth graders learning about energy and phase changes by making (and tasting) ice cream in science! -Sixth graders making creatures that were displayed at the Brave Boat Headwaters outdoor event this past Saturday! -Seventh graders on the Civil Rights team completing a poster campaign about inclusiveness! -Eighth graders presenting summative projects to show what they learned during their Lord of the Flies unit! Click here to read more (newsletter compiled by assistant principal Katelyn Beach).